Watermaid Pty Ltd is a privately-owned Australian manufacturer and distributor of swimming pool equipment based in Sydney, Australia. In operation since 1971, we supply pool equipment world-wide. Watermaid Pty Ltd was the first company to design, develop, and sell salt water chlorinators for swimming pools into the Australian market. We have built a reputation as being one of the most trusted, reliable brands on the market, with unrivalled customer service and support to the pool trade and the end customer. The EcoBlend® - a new generation chlorinator! 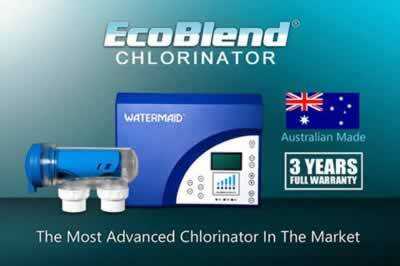 After 3 years of research and development, the EcoBlend® chlorinator was launched in January 2016. It uses the most up-to-date self-cleaning technology available known as 'reverse-polarity'; and is made only from premium quality components. It is compatible with salt, minerals, or mineral-blends and is backed by Watermaid's 3 year full warranty on both power supply and cell. The EcoBlend® chlorinator is an all-in-one salt and mineral-blend compatible chlorinator. Ahead of its time and packed with many useful features, the EcoBlend® chlorinator is built for performance and reliability.